Because honestly. What fun would that be? Seriously though. There are a few good reasons to make your own cauliflower tots. If you like a specific flavor to them. (For example, I like a little heat in mine). Or, such as the case was for me, you are in the middle of a snowstorm, you’re craving tater tots, you’ve given up all forms of potatoes (and other starches) for Lent and you don’t happen to have storebought frozen cauliflower tots. Water is your nemesis when it comes to using cauliflower as a carb swap. So lets just take a moment to go over the methodology I used. Place steamed/drained cauliflower florets into my food processor and puree. Place pureed cauliflower in a sieve or inside some cheesecloth and strain out as much of the water as you possibly can. There’s still water in there. Make no mistake. But get as much of it as you can! Next is by far the most tedious part in the process to me. I make my tots with a melon baller. Essentially I scoop up a bit of the cauliflower mixture, place it in the palm of my hand, and form it into a roughtly cylindrical shape. Then I place it on a parchment lined cookie sheet. Once they are all done, into a 425 degree oven they go! That’s one other important note. Whenever you are faux frying something (anything) you need heat. Don’t be afraid of temps above 425 for oven frying! In this case, the heat is helping in several ways: it evaporates that leftover water (which I bet you will see and feel as you mold your tots) and it ensures a nice, crisp, brown outside. But for goodness sakes, don’t forget to flip them! Now cook time may vary (for mine, I cooked them 20 minutes), but you need to flip them halfway through or one side will be brown (or even burnt) and one side will be super light. Not a good look. From there, your biggest decision is what to use for dip. In these photos I opted for some low-fat ranch dressing. But maybe you’re a ketchup person? 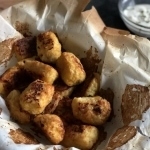 Or perhaps if you do the bacon-chedder cauli-tot (seriously…someone make that and invite me over!) you may opt to dip in some unflavored Greek yogurt flavored with onion powder and chives (mmmmmm). Whatever you decide, make sure it elevates your tots! Yes, you can freeze these. 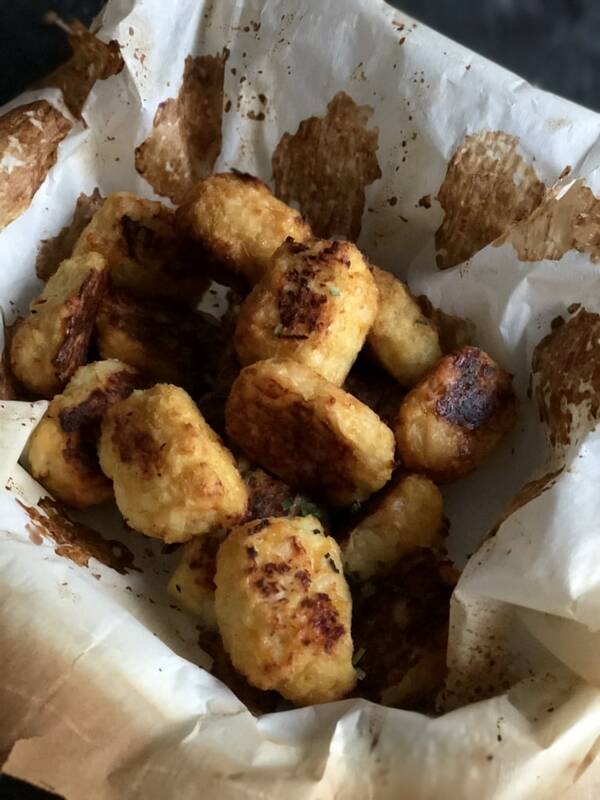 I’d advise you to freeze the uncooked tots on a plate or cookie sheet, before adding to a freezer bag. And make sure to press out ALL the air! Freezer burn does not taste good. As always, no I’m not giving you the nutrition information for this recipe. Nor do I for any of my recipes. You are capable of figuring this out yourself with the information given. I believe in you! 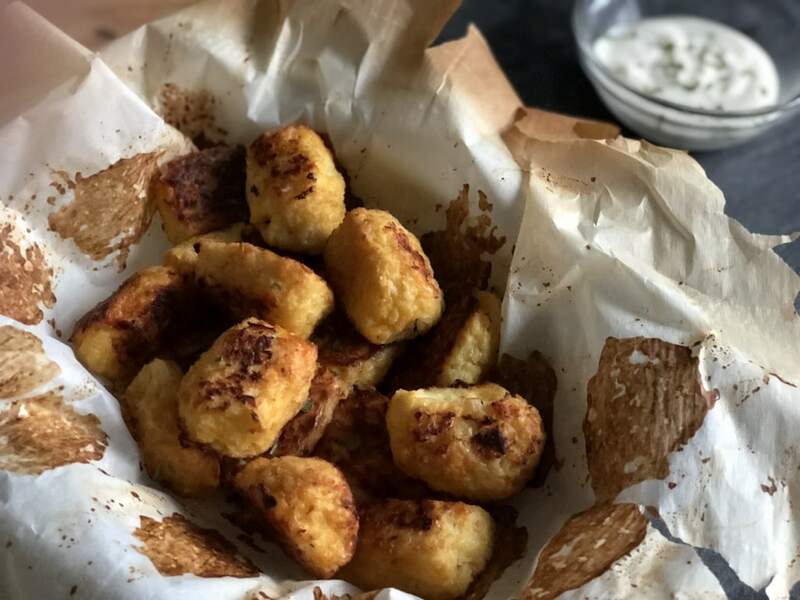 Who needs potatoes when you can have warm, crispy, yummy cauliflower tots! These are so easy to make and the flavor possibilities are endless! After cooking and draining cauliflower florets, pulse in a food processor until fully pureed. Use a cheese cloth or a sieve to strain out the excess liquid (of which there should be much). Once cauliflower is strained of water, empty into a bowl. Add in spices and mix thoroughly. Add egg and cheese and mix until thoroughly combined. Line a cookie sheet with parchment paper. Using a melon baller or small scoop, portion out mixture into the palm of your hand and shape into a cylinder. Gently place each tot on the baking sheet.